Do you want to build your own electric bicycle? Let me show you how to easily build your own ebike today! Well it's easier than you think! This is the only guide you'll ever need to teach you all the basics of building your own electric bike that can take you anywhere you need to go. Electric bicycles are one of the best ways to get around and are much faster and cheaper than being stuck in traffic in your car. It's time to turn your boring commute into an exhilarating electric-powered joyride with your own ebike! Go green with your own environmentally friendly (and fun) electric bicycle! 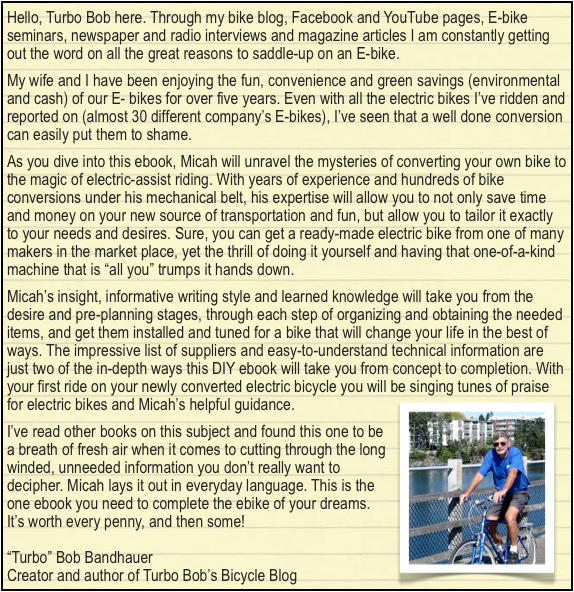 My name is Micah Toll and I wrote an ebook teaching ordinary people how to build your own electric bicycle for cheap! I'm a mechanical engineer that has spent years working in the ebike and electric vehicle industry. 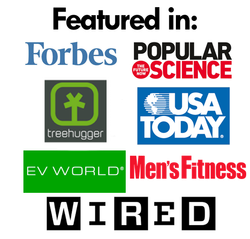 I've worked everywhere from ebike shops to electric vehicle start up companies. Now I'm sharing my experience to help you build your first electric bike as fast, cheap and easily as possible. Over the years I've built and worked on hundreds of electric bicycles across multiple continents and taught everyone from stay-at-home moms to salesmen how to build and maintain their own do it yourself (DIY) electric bicycles. This experience has taught me all the secrets of the trade on both commercially available ebikes and do-it-yourself ebike conversions. I've worked with nearly every single electric bicycle parts supplier electric bicycle conversion kit manufacturer and I know who to deal with and who to avoid. If there is an ebike motor, ebike battery or complete ebike conversion kit out there, I've probably used it. Now I'm putting all of my experience to work for you to help you build the best ebike for your commute. * Learn to build an ebike to fit your budget (starting at just a few hundred bucks)! * Save money every day on gas, insurance, and car payments! * Reduce your carbon footprint! * Never worry about finding a place to park! * Turn every commute into a joyride! * Join the green movement and start using sustainable transportation! There are many different types of electric bicycle parts out there including tons of different ebike batteries, ebike motors, hubmotors, complete electric bicycle conversion kits, and more. There are so many options when building a custom ebike that without guidance, it can seem overwhelming to choose the right electric bicycle parts for you. My experience in building hundreds of electric bicycles has taught me how to match the right ebike parts to the rider's needs. Whether you want a fast electric bicycle, a cargo ebike for hauling all your groceries or just a daily commuter ebike with great range, my ebook will show you exactly which ebike parts you'll need and how to use them to easily convert a regular bike into your own custom do it yourself electric bicycle. Electric bicycles are becoming quite popular in many cities and suburbs. You've probably seen them around your town or perhaps saw a video online and now you're interested in learning how to make your own electric bicycle. Retailers know that and are trying to cash in by selling overpriced electric bicycle conversion kits. Others are selling cheap ebike kits of questionable quality. I've seen it all and learned where to buy ebike parts and kits and which places to avoid. I put all of that experience into my ebook to help you find the best places to buy quality ebike parts and inexpensive electric bicycle conversion kits to build the best ebikes with the least amount of money and hassle. "A wise man learns from experience, a wiser man learns from other's experience." So what does this complete DIY electric bicycle ebook cost? My DIY electric bicycle ebook, which is not available in stores, gives you everything you need to know to build your own ebike (and how to save money while doing it). My ebook normally sells at its retail price of $40, but this month only I'm offering it for just $19.95, that's 50% off until the end of the month! Your copy of my electric bicycle ebook is one simple download away! Immediately after purchasing my ebook using the "ADD TO CART" button above, you'll receive a link in your email to download the ebook right to your computer. It is available immediately after purchase and is viewable on any computer and most smartphones/e-readers too. Most computers have a PDF reader built in, but if you don't have one, you can download Adobe Reader for free. When building your own ebike, you're already going to be making a good investment of hundreds of dollars on the ebike parts and components you use. In my ebook, I help you save money by determining exactly what ebike components are appropriate depending on the type of electric bicycle you want to build AND I tell you exactly where to get those parts for the best prices. By spending $19.95 on this ebook, you can save HUNDREDS of dollars during your ebike build. That's not an exaggeration - I often seen people with their own DIY ebikes who I could have helped build a better ebike for half the price if they had just used the tips and lessons I put in my ebook. Everyone wants an inexpensive ebike, now you can use my ebike ebook to learn how to build your own electric bicycle today. I'm also including two free bonuses with my ebook to help make your ebike build even easier! These bonuses are 100% free and come in the same download. Bonus #1 - A great extra value and now yours FREE! 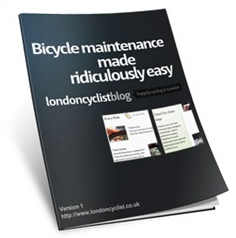 "Bicycle Maintenance Made Ridiculously Easy"
This bicycle maintenance ebook is a great resource for every ebike owner. It details all of the important maintenance needed by any bicycle (including electric bicycles) to keep them in good running order. This ebook shows you how to do all of your own repair work, from tuning your brakes to tightening your spokes. Why pay a bike shop for things you can do yourself? Every trip to a bicycle repair shop for a tune-up can easily cost $20 or $30 for simple work that you could have done yourself in your own garage or living room! Save yourself money and keep your ebike in great condition with this excellent resource. It comes free when you download my ebook. Bonus #2 - Included for FREE with your download! "The Rider's Checklist" is an all-in-one resource for everything you'd ever need to know about riding or maintaining your bicycle. From choosing a good bicycle pump for your ebike to keeping everything clean and oiled, this ebook can help you keep your electric bicycle in excellent condition. If you want to make sure you're getting years of fun and service out of your new ebike, you'll want to put the excellent information from "The Rider's Checklist" to work for you. It's not only full of excellent resources, but is also loaded with tons of quality pictures to help you understand the in's & out's of your ebike. From basic maintenance to choosing the right products to have on hand, this bicycle ebook designed for beginners makes a great addition to my Ultimate DIY Ebike Guide. Plus, it comes free with your download, and you can't beat that! Bonus #3 - Another FREE gift! "Soldering is Easy (Here's How To Do It)"
This ebook, by Mitch Altman, Andie Nordgren and Jeff Keyzer, is a great instructional guide on the practice of soldering. Designed in a graphic format, "Soldering is Easy" is a full of easy to follow illustrations and diagrams showing you the proper way to make solder connections for everything from wires to circuit components. Some of the parts will be more than you'll need for building your ebike, but the knowledge is invaluable and will certainly help you with every electronics project you attempt from here on! 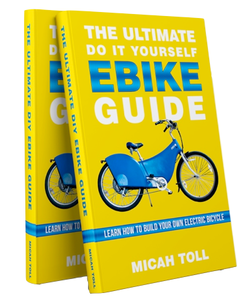 That means that you get my ebook, "The Ultimate Do It Yourself Ebike Guide" PLUS three free bonuses: "Bicycle Maintenance Made Ridiculously Easy", "The Rider's Checklist" and "Soldering is Easy (Here's How To Do It)", all for one low price for a limited time. I can't run this sale forever, so get your copy of my electric bicycle ebook while it's still on sale... just click the "ADD TO CART" button below! ...And just one more thing! I'm 100% confident that you'll love my DIY electric bicycle ebook and find it crucial to helping you get through the process of building your own electric bicycles. I've worked hard on this ebook and put thousands of hours of work and tons of experience into its pages. If for some reason though you find that you aren't 100% completely satisfied I'll gladly return your money, guaranteed! 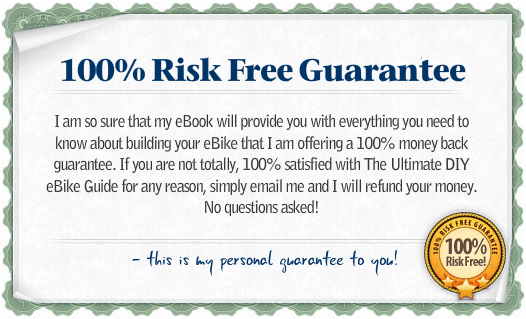 That means you can buy my electric bicycle ebook 100% risk free! If it doesn't help you, I'll send your money back! I can offer this guarantee because I've had such a great response from readers of my ebook that I want to make sure there is nothing stopping you from trying it out yourself, risk free! What are you waiting for? You can't find such a complete guide on building electric bikes like this anywhere else! So hurry up and grab it while it's still on sale until the end of the month. Get started on your own electric bicycle conversion today! Want more than the book? Get the complete ebike video course! Reading a book is great, but what if you want more than just words on a page? What if you want to watch an ebike getting built right before your eyes? Well then you're in luck, because I've created a video course just for you. The "Ultimate DIY Ebike Video Course" goes even further than my book by taking the information you're learning and showing you how it's done right before your eyes! My video course contains 18 lessons divided similarly to my book, taking you from the planning stages to navigating parts suppliers and vendors, all the way through installation of your ebike parts and maintenance of your completed ebike. Intrigued? I put a lot of hard work into my Ebike Video Course, packing it full of useful information, demonstrations, parts lists, vendor comparisons, accessory reviews and more. Learn more about it at www.EbikeVideoCourse.com and get my ebook for free when you sign up for the video course!